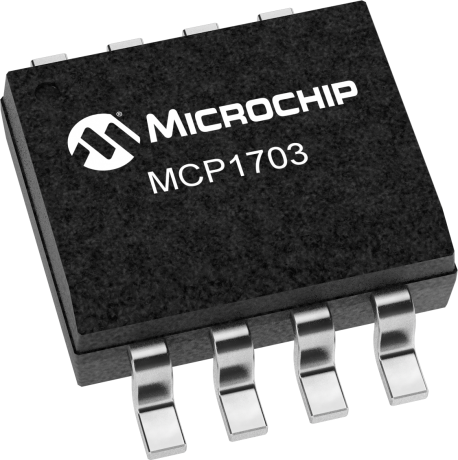 The MCP1703 is a CMOS, low dropout voltage regulator with 250 mA maximum output current. MCP1703 works with input voltage of up to 16V and in combination with its low current consumption of 2 µA is an ideal solution for applications using multi-cell, 9V alkaline or one-, two- or three- cell lithium-ion batteries. It is available in space efficient SOT23A and SOT89 packages or in a thermally capable 3-pin SOT223. For new designs, please consider the MCP1703A, which contains several improvements over the MCP1703. The SOT23-3 Voltage Regulator Evaluation Board is designed to evaluate and test voltage regulators. By soldering the desired device to the evaluation board, the user can easily validate several parameters of the device.